Chicken marinated in buttermilk then seasoned to perfection and fried until golden brown with homemade pan gravy made with milk, flour and pan drippings. 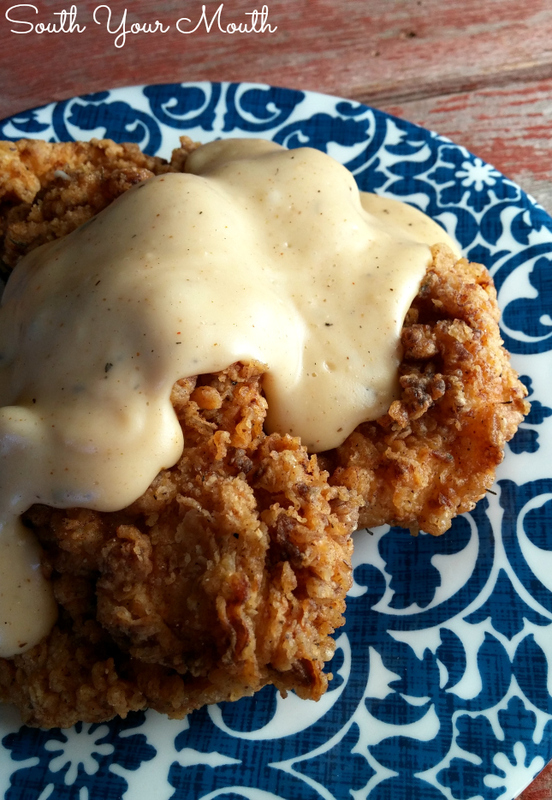 Post includes traditional and "chicken-fried chicken" recipes. I did something this weekend I seldom do anymore. I fried chicken. And it was glorious. I waited a little too long to get going with this one yesterday so my entire family was positively starving [have mercy! ] on the verge of falling out and fainting [oh lawww! ] writhing around on the floor delirious with hunger [hep us all! ] by the time I got everything on the table. I will admit it was a little torturous to have the whole house smelling like a Colonel Sanders convention at lunchtime to have to wait to take photos. I doubt too many people would complain about this particular problem when this is what you get to eat for lunch at home while still in your pjs. Am I right or amIright? It can be quite an undertaking to fry up a good batch of chicken so I don’t do it much. I got a hankering for it this weekend and decided to make “country fried” chicken instead of the traditional bone-in chicken because it’s so much quicker! 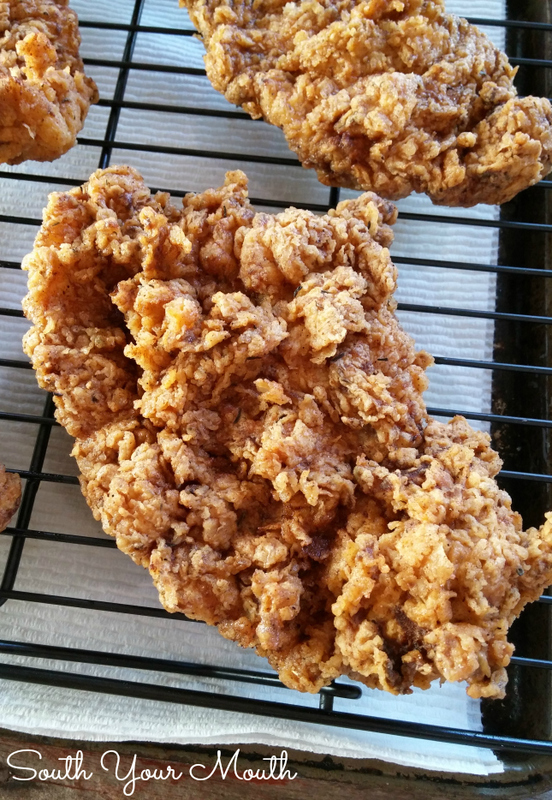 When I just use boneless, skinless chicken breasts I call it country fried chicken because, to me, it’s just like country fried steak (just a portion of meat that’s been pounded out or tenderized that’s fried and served with gravy). It cooks up in half the time and tastes every bit as good! 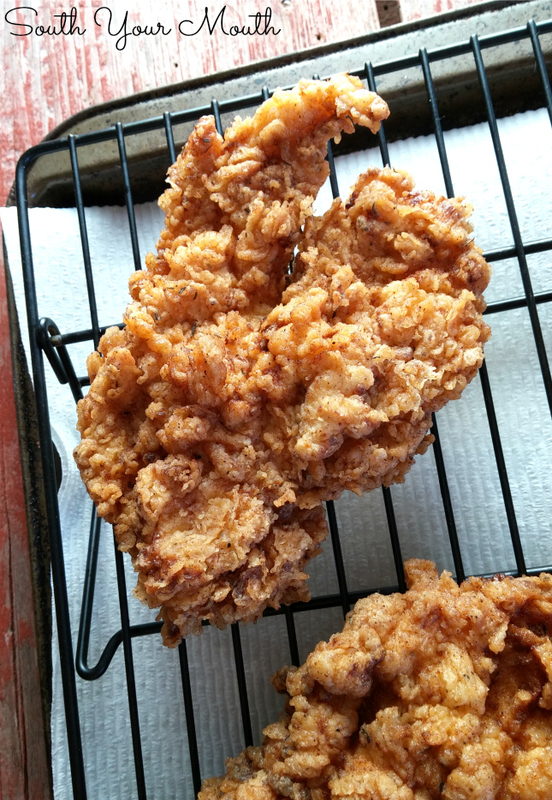 Whether I’m cooking traditional Southern style fried chicken with bone-in, skin-on pieces or thin cutlets for country fried chicken, I use the same recipe and method. So we can call this one a twofer. 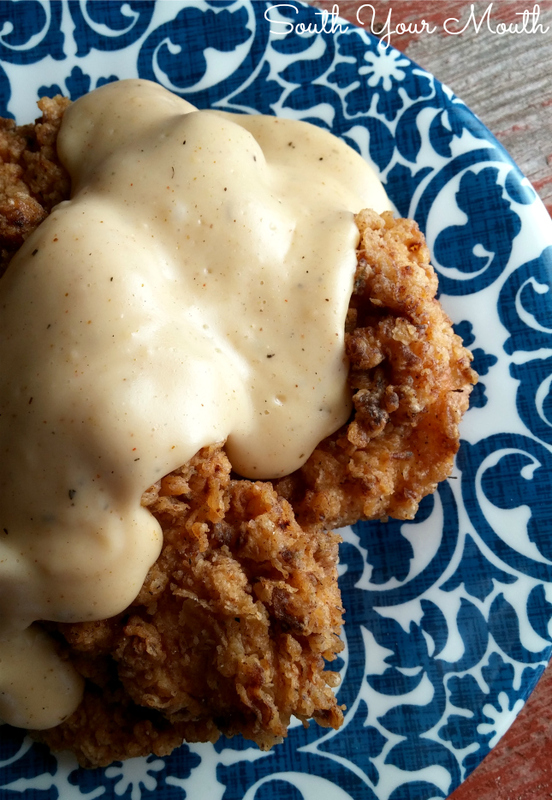 Because you’re getting two recipes fer one :o) You might also want to take a look at this recipe for Chicken Fried Steak! Cover chicken in buttermilk and marinate for 4-6 hours (or overnight). Drain chicken then lightly season with salt and pepper; set aside. Whisk together eggs and hot sauce in a shallow bowl; set aside. Combine flour and remaining ingredients in a large bowl and mix well. Reserve 1/4 cup of mixture for gravy. Set aside. Heat 3-4 inches of oil or shortening in a large pan or skillet (I use my 12-inch Dutch oven) to 325 degrees if using bone-in pieces or 350 if using boneless (see note below). Dredge one piece of chicken in flour and shake off any excess. Dip chicken in egg wash and shake off any excess. Dredge chicken back in flour once more taking care to thoroughly coat the chicken; shake off any excess. Repeat with remaining chicken pieces. Fry chicken until dark golden brown on the outside and juices run clear on the inside. Cook in batches so not to overcrowd the pan. Serve with gravy (recipe below). Note: For traditional fried chicken, use bone-in, skin-on pieces of white and dark meat chicken (I usually cut the breasts into two separate pieces). We will fry these at 325 degrees. 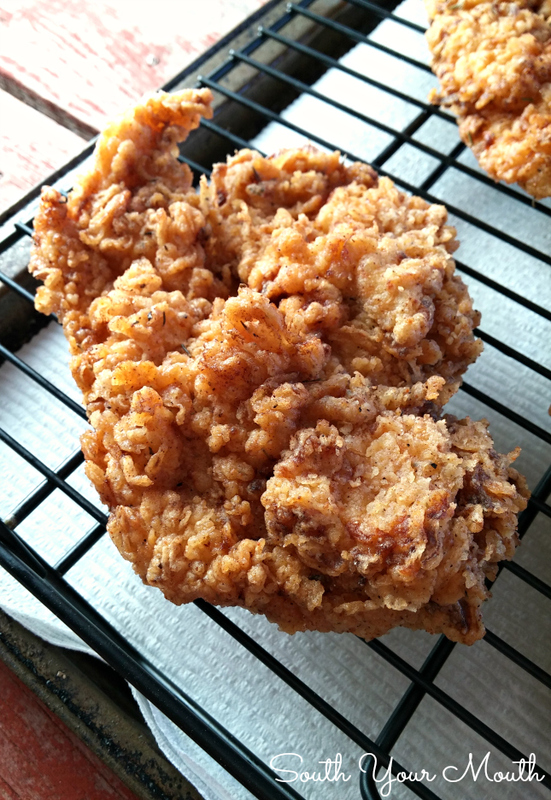 For “country fried” chicken (pictured in this post), use 3-4 large fresh boneless, skinless chicken breasts and follow the below instructions. We will fry these at 350 degrees. To prepare the “country fried” chicken, cut each breast into two cutlets (reducing the thickness by half, not the width or length). Gently pound out the cutlets with a meat mallet (or juice glass or rolling pin or whatever gets ‘er done) until flattened and even in thickness. Pour off all but 1/4 cup of pan drippings (I usually just eyeball this but if you’re unsure, simply pour off all the oil then measure 1/4 cup and add back to the pan). Whisk in flour and cook over medium heat until roux is light brown (about 2-3 minutes). Slowly whisk in milk. Cook and whisk until gravy is thick and smooth. Add more milk if needed to reach desired consistency. Add salt to taste if necessary. I have been cooking my chicken like this for close to thirty years, except I put hot sauce (Franks) and crushed garlic cloves into the buttermilk marinade overnight. Delish! Also find that getting the fry right is tricky for newbies to real fried chicken. I found best tip ever years ago in Southern Living - put in moderate high oil and cover for 6 mins then uncover for 4 mins. Flip and do the same. You have to adjust for large pieces and remember that a thigh will take longer than a breast. I think the covered skillet steams the meat for quicker cooking and the uncovered time allows the breading to crisp. That's how I fry mine. Fry brown, cover,flip, brown and into the oven when all the pieces are done to finish 'frying'. I also like to season the raw chicken pieces individually. Oh this sounds delicious! I am getting my trusty old black cast iron skillet out already. I don't know if it's just tradition, but that is the secret to getting this just right. Do you typically use shortening, vegetable oil or peanut oil? I've never used shortening so it's mysterious to me! Wondering if that makes a difference at all.. I think it's the trick, actually! It makes for the best crunch and gives the coating almost a flaky texture. I swear it's less greasy too (notice how you don't see any grease spots on my paper towels?). All of the above works but I like shortening best. And If you really want a treat, use real lard. Even better! what would you think about using a deep fat fryer? blasphemy? Lord, no! That would be perfect! I would use one if I had it. Thank you. I was just wondering about a deep fryer. Oh Mandy - I've never made real fried chicken and I think the time has come! Holy Cow that looks so good!! So for the boneless variety you made - boneless, skinless right? Can't believe the coating sticks so well w/o skin - YUM!! Can't wait to try!! I made this last night, and it was soooo good! When my hubby saw it, he said "Wow! I'm impressed!" Made it all worth while! The leftovers are good the next day, too1 :D Thanks! Just found your site from a pin someone posted on Pinterest!! I am so thrilled I did :) You have so many yummy recipes on here! That looks so good! I'm like you, I can't tell you the last time I fried chicken. It's time consuming and messy, but what a crowd pleaser. Thanks for sharing! I can't wait to try this! What's your preferred hot sauce brand?? This was great! I used thinner boneless chicken breasts (purdue perfect portions sized) I heat the vegetable oil in a big pan to 350 degrees and fried for 8 minutes. Came out perfect,. 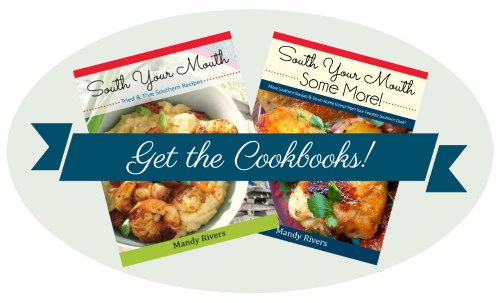 Girl me and you can be friends with all these delish recipes! Reminds me of my grandmas cooking. Dang...that's way too complicated. I just cut up a yardbird, salt the pieces, shake it in flour and fry it in any kind of cooking oil. My mother used shortening, but I use canola oil. A few extra steps but way better than just shaking it in flour. She knows what she's doing! I made this for supper last night and let me tell you, it was fabulous. I used boneless, skinless chicken breast. My chicken looked just like the picture. Nicely breaded and golden brown. Thank you for sharing this amazing recipe! So, does the chicken have to be pre-cooked in any way before breading and frying? Doesn't the breading get too dark by the time the chicken is cooked all the way through? Really good chicken and gravy. I will make again. Thanks for the recipe! Hon...there really is none...this is protein, and that is it!! LOL!!! Not many benefits, but OHH LORD IS IT GOOOOOOD...AS LONG AS YA DONT EAT THIS WAY "DAILY", WHY NOT SPLURGE EVERY NOW AND THEN??? TRY IT FOR A WEEKEND "TREAT"...WHEN I DO, I MAKE SURE I EAT HEALTHY FOR BREAKFAST & LUNCH...SPLURGE FOR DINNER!!!! NOTHIN LIKE GOOD, OLD FASHION FRIED CHICKEN! !